Last Summer I took a trip to Venice with my family, and as Spring finallyyyy warms up - we've booked our next trip to Italy. As my Mum and sister scrolled through endless pages of apartments and accommodations, I decided to scroll through my camera roll and take a look at our trip to Venice last year. And it really was great. So, I thought I'd share with you my highlights from our little trip to Venice. We spent two weeks taking a little road-trip through Italy: starting of in Milan we headed to Venice and then finished off in Verona. Each part of the trip was incrediblllle - but it was walking around Venice that felt pretty surreal. So imagine the splendour of a city of marble palaces on a lagoon - and that's just the start of this surreal city. And oh wow you will have never seen so many individual boats and gondolas in your life. The gondola is pictured at the ultimate attraction in Venice, but if you're planning to take a trip in one - remind yourself that the average price is 80-100 Euros for one hour. They're pretty pricey. If you'd rather spend money on gelato or a new designer handbag (ooh la la), the gondola's are still the perfect picture opportunity. 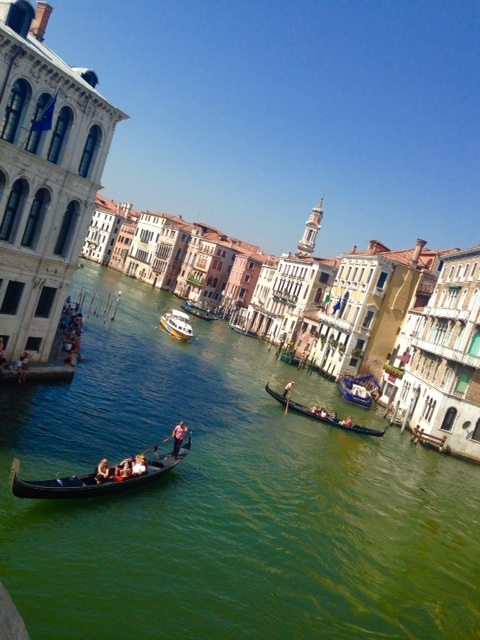 The Grand Canal is of epic grandeur and truly reflects the glories of the Venetian architecture lining it's banks. At the end of Venice's signature waterway, you'll find the Palazzo Dulcale and Basilica di San Marco. It honestly felt like I had stepped into some-sort of black-and-white film or a photoshoot for Dolce & Gabbana. Along the Palazzo fancy restaurants spilled out onto the concrete with string quartets and small brass bands setting the mood. Oh, and despite popular beliefs - Venice doesn't smell like fish. But wait until you see what's hiding in the narrow backstreets (so small you can reach out and put your hands on both sides). Neighbourhood churches lined with priceless marble, little trinket shops selling hand-made souvenirs and luxury designers displaying their newest lines. One minute you can be walking through a maze of unique ice-cream parlours and art galleries - the next, surrounded by Chanel and Louis Vuitton. Venice might seem small, and easy to take in within a day - but trust me, you could spend a week in this fairytale-like bubble and not get bored. Sure, a good three hours will give you enough time for one long gasp at the show-stopper that is Piazza San Marco, but not nearly enough time to see what else Venice is hiding. Choose to stay longer in this wonderful city and you'll discover the true meaning of la bea vita (the beautiful life) that only the locals will know. Find out about the wake-up call of the gondoliers calling 'oooeee', have lunch in a crowded bacaro (bar) with friends and fuschia-pink sunsets that have sent centuries of artists mad. Venetians are used to setting trends, whether it be with controversial artwork, racy new operas or radical new art. On a smaller scale, this ancient creative streak finds vibrant expression in the showrooms of local artisans where you can see custom-made red-carpet shoes and rare glass jewels. In a world of cluttered cultures, Venice stands out. I loved every little bit of Venice, especially the parts that made it unique. I loved taking the water taxi across the city, sitting beside the river in the sunshine and avoiding the fish market. Because once in a while, Venice does smell like fish. One thing we seemed to do a lot in Venice was get lost. Sometimes intentionally, sometimes unintentionally. Sometimes fun, sometimes not-so fun :) In Venice there are soooo many little streets and shops, taking a few hours to just wander and not care about where you're going next is lovely. Venice is such an amazing city! Thanks for sharing these photos! Ok, now I feel nostalgia. *sigh* I'll have to write a post too. The floating city, memories of Ezio Auditore, i would love to visit that amazing place. You really should it's such an incredible place!